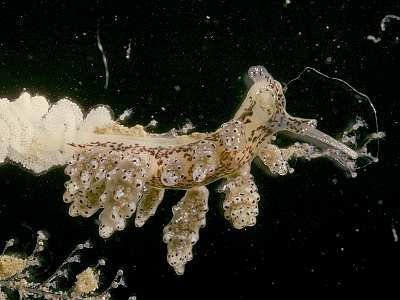 Description: The body of this nudibranch is translucent white with red or black pigment streaks in dense patches on the back and sides. The cerata have round spots of black or red pigment at the tips of the tubercles, with irregular spots of pigment scattered over the surface between the tubercles. The rhinophores have sheaths with margins dilated and extended at the front. Grows to about 20mm in length. Habitat: This species feeds exclusively on the hydroid Kirchenpaueria pinnata and is usually abundant on Kirchenpaueria clumps in late spring. The spawn is a long concertina of white ribbon. Distribution: This species has been reported from numerous localities on the western seaboard of the British Isles, from Shetland and the Faroes south to the English Channel. It also occurs in the Galicia region of Spain. White body with red or black streaks of pigment. Multiple spots on surfaces of cerata in addition to terminal spots on tubercles. Picton, B.E. & Morrow, C.C. (2016). Doto dunnei Lemche, 1976. [In] Encyclopedia of Marine Life of Britain and Ireland.